Well, this week there have been a lot of posts to get us all going. I hope by now you’ve had time to find a journal and try some of the preparatory activities. But, if not, no worries! Everything is there on the blog for you when you are ready. Just look on the right hand side under “Recent Posts”. Also, tomorrow I will be posting a summary article for anyone who missed the start of beta-testing. You can also use that at any point in beta-testing as a quick round-up of everything that’s been sent out. If you are tired of all this “getting ready” stuff, you’ll love this post, because today it’s time to open your journal and start filling pages. But there’s no stress! Today is time to have fun getting to know your materials and getting some “starts” down on the page. These “creative seeds” are both a great warm-up and stress-reliever, and a jumping off point for many later activities. I use them to get my creative juices flowing, to de-stress and whenever I am stuck. I know you are going to have fun with this post! If you were planting a garden, you would not simply go outside and wish for ripe tomatoes tomorrow and expect to have that actually happen. You understand that you have to work the soil, maybe add humus. Rake it smooth, plant the seeds at the right depth, water them. And wait. Creativity does not instantly not arise out of nothing. It needs some ground from which to emerge and often, some time to develop. It needs some seeds from which to sprout. Creative seeds are great for getting started in your journaling practice, but they’re not just for beginners. This is what I do to loosen up, to shake things up when I’m stuck, or to soothe and restore myself when I’m tired or stressed. Creative seeds are also a way to explore new materials and discover what they can do. If you’ve been journaling for a while, playing with new materials can spark new ideas and get you out of a rut. Don’t forget to use your small starting ritual, if you have one. Light your candle or make your cup of tea. Put on your favorite music and take a deep breath. Let go of everyday concerns, ask your inner critic to go elsewhere for a while, and invite your heart and spirit to speak. Take your journal, and open it to a page somewhere in the middle. This is important! Starting in the middle is one of the most helpful tricks I know for keeping your journaling open-ended, nonjudgmental and free. Then try one (or more) of the “creative seeds” below. Don’t think too much about it. You just want to add some visual elements to the page. There’s no need to know right now what these elements might mean or how you will use them. When the right moment comes to develop a Creative Seed further, you’ll know. As you work with later exercises, you’ll see how these seeds will help you give you a starting point and stimulate your imagination. No need to face that scary blank page! If you don’t have the materials for a particular seed, just skip it. This is a collection of ideas, not a list of assignments. Take your pen or pencil (or crayon, marker, glitter glue—whatever feels right) and place it somewhere on the page. Allow your hand to choose a movement that pleases it. Make a mark. Without thinking too much about it make another mark and then another. The new marks can echo or respond to earlier marks, or start a new pattern. Again, without thinking too much about it, continue to make marks that respond to the previous marks or feel pleasing to your hand. In other words, start doodling. There’s no need to fill up the page. There’s no need to be confined to a single page, either. You can let your doodle cross from one page to the facing page, or even go around the edge of a page to the next page. Doodle until you find yourself feeling restless and then move on to some other work. A doodling start. It doesn’t have to be anything. It doesn’t have to fill the page. I might come back and doodle more later. I might add color. I might just use it as a decorative flourish to some writing. I don’t have to know right now. Now open your journal to another page and start another Creative Seed. There are some more ideas below to get you started, or you can do anything else that appeals to you. The goal is simply to get something down on the page that will form the basis for later work. Since you don’t know what that work might be, the more spontaneous your “seeds” are, the better. Start by making squiggly shape out of clear water. Then, make some puddles of strong color on your watercolor palette, or by adding water to your pan colors and “scrubbing up” some color with your brush. Use your brush like an eyedropper to soak up and deliver color to your water “squiggle”. Try placing color right at the edge of the squiggle and letting it flow outward of it’s own accord. Put down a squiggly puddle of water. Make it a real puddle, not just a damp spot. Mix up some juicy watercolor on your palette. Use the brush like an eyedropper to deliver a drop of color to the edge of your puddle-squiggle here and there. See how wet it is? Water on the surface is what allows the color to move and mingle. Drop in some different colors at different places. As long as there is water on the surface of the paper, the color will move and mingle. To get interesting color blends, don’t let things get too wet. If you add too much wet paint, everything will run together into one big blob of color. If that happens, don’t stress. Part of the point is to let whatever happens, happen. If it doesn’t turn out as you expected, no big deal. It’s a seed. You don’t know what might develop later. And that’s okay. Try adding a different color in a clear area. They’ll move and mingle. Use the brush to deliver a new puddle-squiggle, letting it just touch the area of wet paint. The wet paint spreads into the new puddle-squiggle. Place a few wet puddles of color on the page, and fold over an adjacent page, pressing down to spread the color and make an inkblot. Here’s another puddle-squiggle of colors. Fold the neighboring page over and press. Ink-blot! This might get developed into a single image covering two pages, or two images on facing pages in relation to each other, or as completely separate images. Try putting different shape on each side, and then folding over the page and pressing again. Fold one page over the other and press down to transfer the color. How much paint transfers and how much runs depends on how wet things are. It’s unpredictable—that’s a good thing! 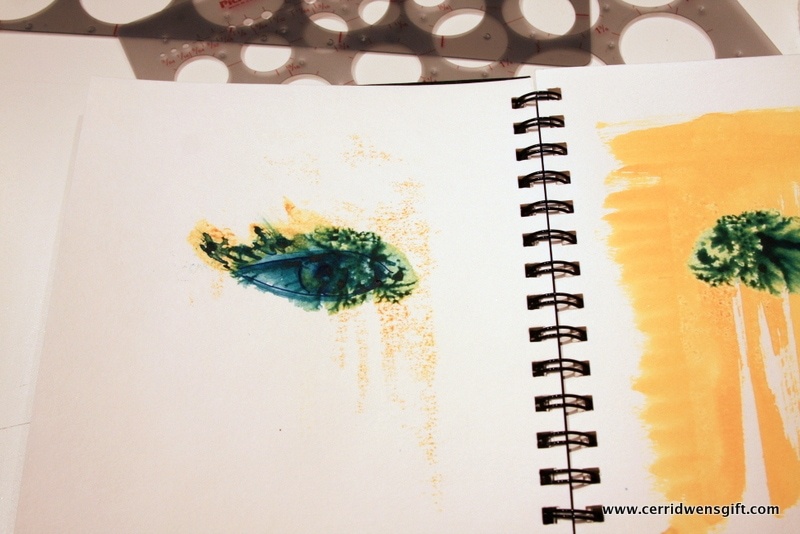 Create random patches of color by using your brush to fling, smear, spatter or drip wet color. Pick up color on a flat or crumpled piece of paper or plastic film and stamp it onto your page. In fact, any reasonably flat object that you don’t mind getting paint on can be used to transfer color to the page—coins, keys, lace, string, fingers. To make the splotchy texure on the left side, I painted some color on a square of waxed paper and then pressed it onto the page. On the right, I made the “flower” shape by pressing a brush down on the paper over and over in a circle. Then I used colored pencils to start doodling. This page makes me want to write about joy and celebration! Usually, the color won’t transfer uniformly, and that’s a good thing! Partial images and “broken” shapes can be much more mysterious and evocative than clear transfers that are recognizable. Stamping and transfers with acrylic paint with give a somewhat different look, because acrylic paint has some stickiness and body. You can let one color dry and do another layer in a different color, nearby or overlapping. Or you can add a new layer while the first layer is still a little (or a lot) wet, and the colors will mingle. Calming our analytical, “verbal”, rational, linear-thinking selves doesn’t mean we can’t use significant words or phrases that inspire or challenge us, or that we won’t do any writing in a Creative Energy Journal. We will! We’ll just use words and writing a little differently than if we were sending an email to coworkers. Think free-writing, poetry, stories, songs, dreams, fairy tales, myths. But, also analytical, goal-oriented, linear writing when that’s appropriate. The goal is to be able to use both our rational, analytical, “get-things-done” selves and our creative, intuitive, “anything-is-possible” selves. If there is a word or phrase that inspires you, that seems to keep cropping up everywhere, that is significant for you, you can write or stencil it across a page as a Creative Seed. Instead of jumping right into writing explanations or analyzing why this word or phrase is meaningful, try spending time with these words in other ways. Use a lettering template to stencil them in an interesting font. Decorate the letters. Write the same word/phrase again and again to make an overall pattern in an area of the page, write the words in different colors and styles, use your non-dominant hand. Symbols and shapes can also be good Creative Seeds. Trace the outline of an animal that has significance for you and fill the outline with color or pattern. Cut out a meaningful symbol or image from a magazine or print it from a website and collage it onto the page. Or, press a paper cutout or rubber stamp into paint and transfer it onto the page. Don’t let yourself be stopped by worries that you “can’t draw”. The point is to get a meaningful image onto the page. Use tracing, stencils, stamps, rulers and templates freely. Remember, this is going to be a Seed for further development. You’ll be doing more with these Seeds later, so don’t be concerned if your starting point is a bit mechanical. It won’t stay that way! Repetitive motions can help induce a meditative state. Some people find it soothing to fill an area with small pencil strokes or circles or other repeating patterns. Some find the process of shading an area with colored pencils or crayons relaxing. Don’t feel compelled to fill the page—that’s usually where “soothing” gives way to “boring and onerous”. If there are times you find this sort of repetition appealing, you can use it to create Seeds for later work. If you find it stultifying, don’t force yourself. Sometimes, the repetitive motion of shading areas with colored pencil or crayon is soothing. I added a little watercolor on the lower left corner. You can plant these Creative Seeds in your journal any time. This is a good way to stay connected to your journaling routine in times when you are feeling depleted. You don’t need to fill the page (not even close!) and you don’t need to think or plan. You can start with a feeling or a thought, and put down anything that seems to flow from that feeling or thought. Later, when you are working on a different activity, you may find part of a page that seems somehow connected, and use that Creative Seed as a starting point for the day’s work. If you don’t see how you are going to get anywhere starting from these random Creative Seeds, don’t worry. Later activities will give you lots of different ways to explore and elaborate on your Creative Seeds. For now, let them be a way to enjoy and explore your materials and don’t worry too much about what they mean or how you might develop them further. That’s it for today! With this post, beta-testing is officially underway! How is it going so far? Have you been able to find supplies? Are you as excited to start as I am? After today, you’ll get email once a week on Friday evening with links to the week’s new post(s). I’ll be posting occasionally midweek, so if you get bored between emails, by all means check the Creative Energy Journaling Facebook page or the blog front page to see if anything new has been posted. Happy journaling! Please share how it’s going, either in the comments here or on our Facebook page. I’m excited to hear how you are doing so far!